Routing devices periodically send hello packets to each other to dynamically learn of other routers on their directly attached networks. This information is used to discover neighbors and to learn when neighbors become unreachable or inoperative. By default, hello packets are sent every 5 seconds. The exception is on low-speed, nonbroadcast multiaccess (NBMA) media, where the default hello interval is 60 seconds. Low speed is considered to be a rate of T1 or slower, as specified with the bandwidth interface configuration command. The hold time is advertised in hello packets and indicates to neighbors the length of time they should consider the sender valid. The default hold time is three times the hello interval, or 15 seconds. For slow-speed NBMA networks, the default hold time is 180 seconds. Route delay in tens of microseconds. Likelihood of successful packet transmission expressed as a number between 0 and 255. The value 255 means 100 percent reliability; 0 means no reliability. Effective load of the route expressed as a number from 0 to 255 (255 is 100 percent loading). Minimum maximum transmission unit (MTU) size of the route in bytes. It can be 0 or any positive integer. The ip summary-address eigrp command is used to configure interface-level address summarization. 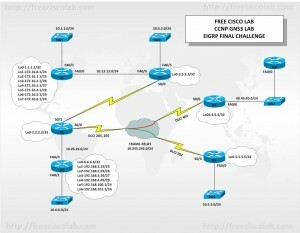 EIGRP summary routes are given an administrative distance value of 5. The administrative distance metric is used to advertise a summary without installing it in the routing table. Configuring the leak-map keyword allows to advertise a component route that would otherwise be suppressed by the manual summary. Any component subset of the summary can be leaked. A route map and access list must be defined to source the leaked route. Leak-map option is only available under physical interface or a virtual-template interface. So if you don’t find this under the sub-interface then don’t freak out. If the leak-map keyword is configured to reference a nonexistent route map, the configuration of this keyword has no effect. The summary address is advertised but all component routes are suppressed. If the leak-map keyword is configured but the access-list does not exist or the route map does not reference the access list, the summary address and all component routes are sent. EIGRP is the only routing protocol that allows unequal cost load balancing with the help of variance command. We have to check one condition before we can perform unequal cost load balancing. AD of the worst route should be lower than the FD, this is known as the feasibility condition. To get the value for variance, let’s divide the FD of the worst route by the best route. Round off this number and this is your variance value. EIGRP route authentication provides Message Digest 5 (MD5) authentication of routing updates from the EIGRP routing protocol. The MD5 keyed digest in each EIGRP packet prevents the introduction of unauthorized or false routing messages from unapproved sources. By default, EIGRP packets can consume upto 50% of the link bandwidth configured under the interface. We can change this by using the interface level command “ip bandwidth-percent”. Another way would be to change the bandwidth on the interface so that 50% of that bandwidth is the value that you want the routing protocol to use. An offset list is the mechanism for increasing incoming and outgoing metrics to routes learned via EIGRP. An offset list provides a local mechanism for increasing the value of routing metrics. Optionally, you can limit the offset list with either an access list or an interface.